We were at 7am at the airport. What a small airport it was, funny! 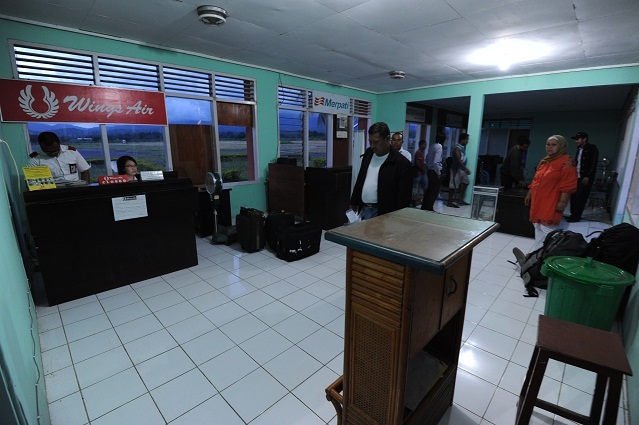 Here is the room for the check-in of luggages. Here is the waiting room. And that’s it! 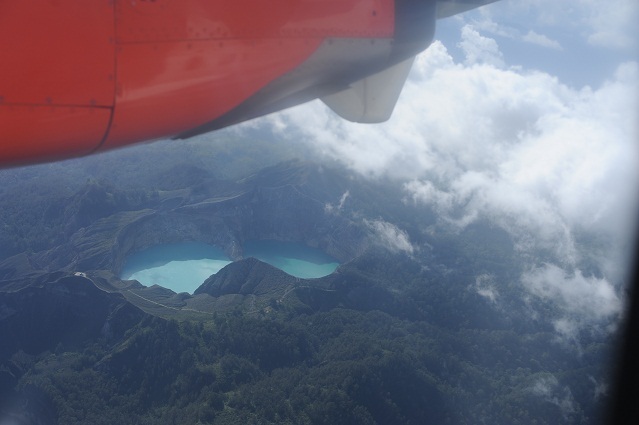 We saw the three Kelimutu lakes from the plane. It was on the right, and when they announced we could see them, there was a massive movement of people to the right, including me of course, putting the plane’s balance at risk! I got a crap seat, with the plane “helices” running, always present on my pictures. Beeeee. 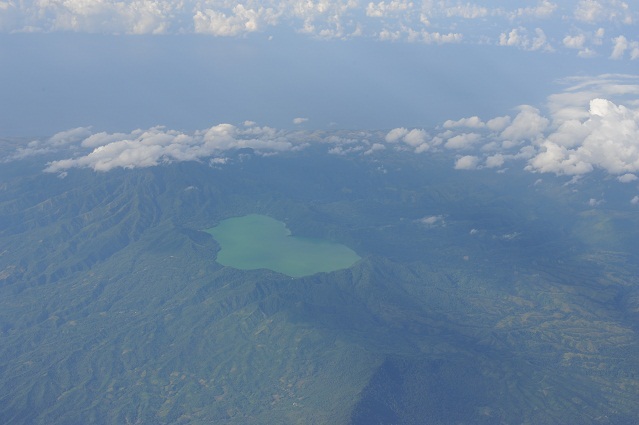 Still, seeing these lakes from above was really nice. 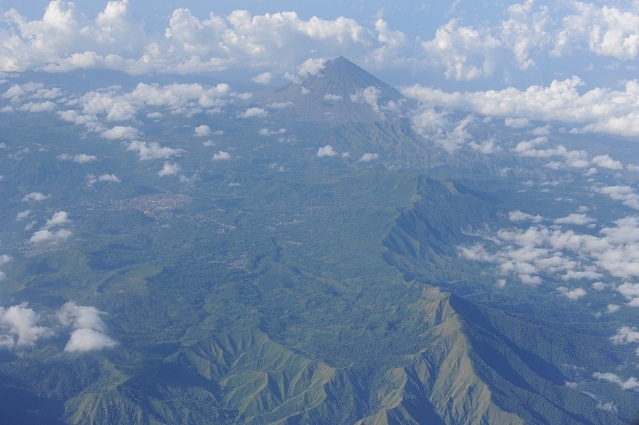 There were great views from the plane, like this volcanic range. There was another beautiful lake also at some point. 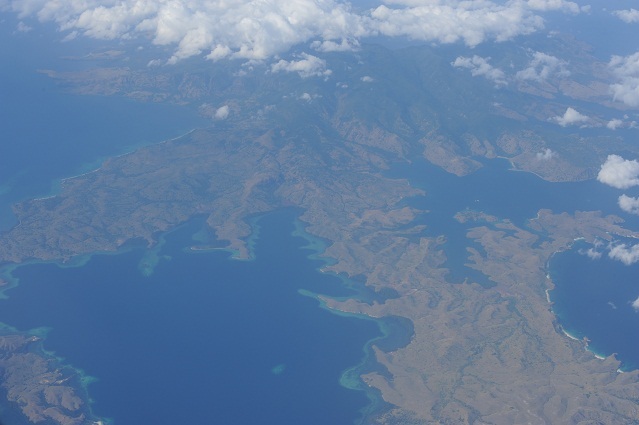 Then we saw Komodo and Rinca islands. We also saw tiny little “Manta Ray” island. Its shape looks a bit like a manta ray, doesn’t it? I saw also a rainbow. 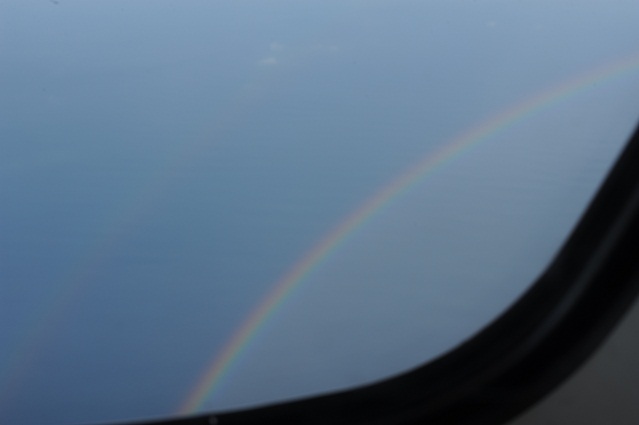 I love rainbows, even more when seen from the plane. They are magic. 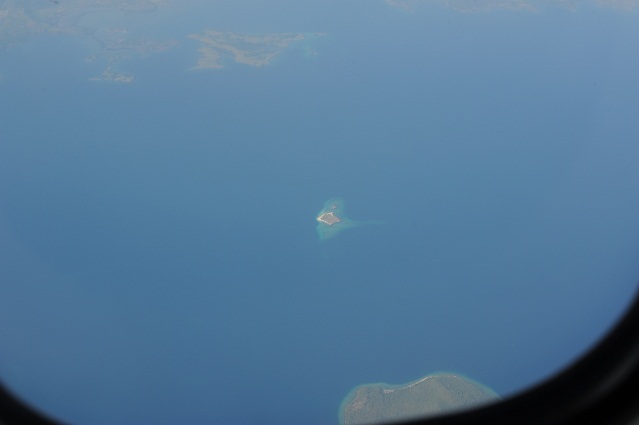 Then we flew over Sumbawa, and Lombok and finally arrived in Denpasar, Bali. 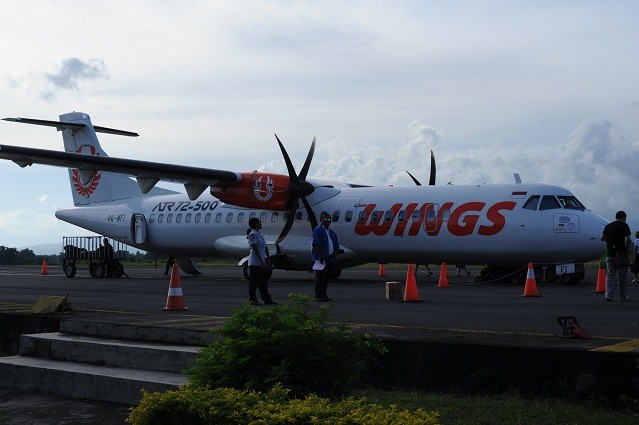 During the flight, I heard from a British guy who had been living on Flores for the last 43 years, that François Hollande had won the elections the previous day, and was now president of France for the next five years. Cool! Let’s see how he goes…Funny to learn that from a British. I realised how completely disconnected from the world I was now, ahah. I also had more important things than a change of president for a country I don’t even live in to think of that day. During the flight, I kept thinking and thinking, about my grandfather, about how sick I was of Asia, that I wasn’t enjoying it anymore at all, and that I needed a drastic change of landscape right now. See, I don’t really like to plan. I like being able to change plans at the last minute, it is exciting and it gives you the biggest freedom of movement you can ever wish. I checked with Michael that it would be ok, and I decided to not stay in Asia anymore, but to join him 3 days later and go to Australia with him. 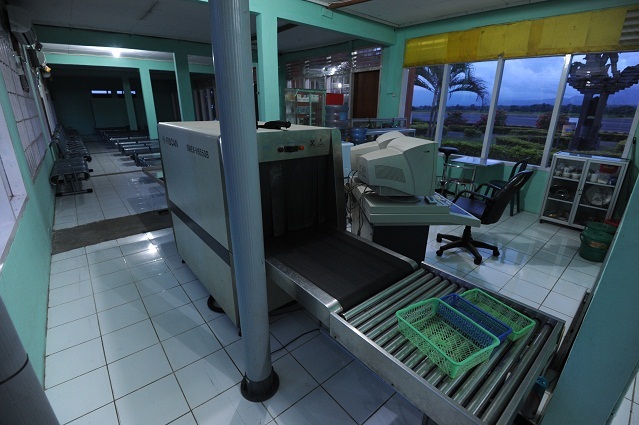 We got to Bali and I went to Air Asia counter and bought an airplane ticket for Perth. We spent the next few hours on the great wifi of the airport. I made my free 3-months online e-visitor visa and that was it. 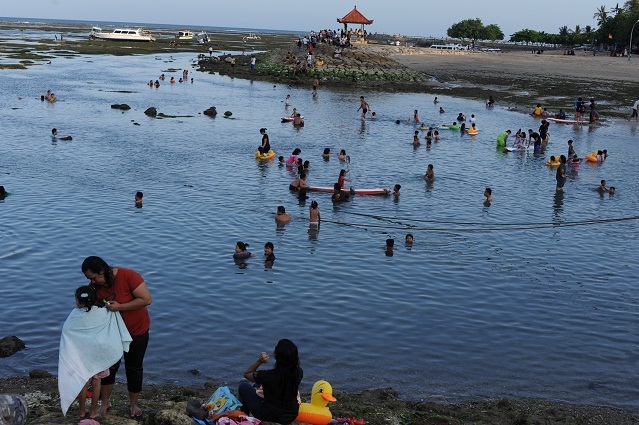 This time, we wanted to avoid the hectic crowded dull Kuta, and took a taxi to Sanur, a bit further North-East. We checked in a cheap hotel and went to the beach. 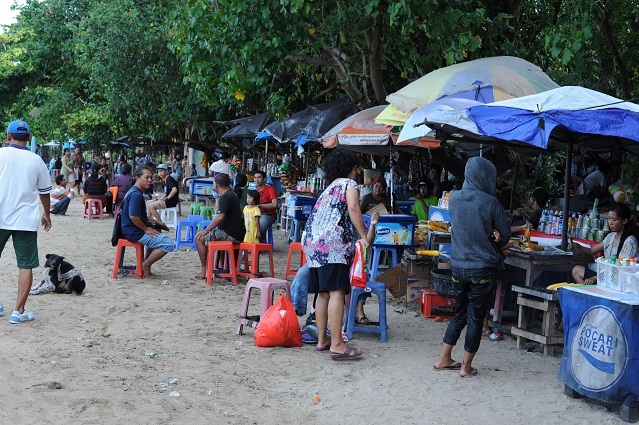 There were a lot of stalls on the beach side. 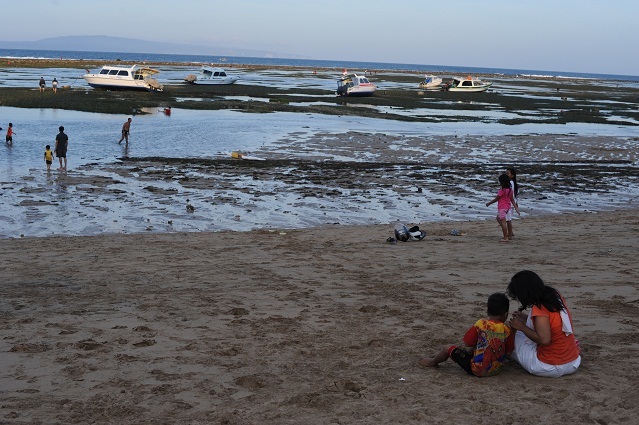 There were not many tourists, mostly Indonesian people there. It had a great laid-back atmosphere. We sat on the beach, watching the sea. Somehow, I almost felt a bit back in Brittany for a minute, as it had this tide going up and down, and all these algues and stripes of sand spread all around. That sensation felt good. In the evening, we had some diner at a cool restaurant, and were amazed at how empty of Western tourists the streets were compared to Kuta, while Sanur was offering almost exactly the same things. We spent the 2 days in front of our hotel, on computer. 2 days to stop, and rest, after so much rushing around during the previous weeks. I finally managed to write the last articles about Burma and the ones about Malaysia and even write the first one about Flores. Youhou! We also discovered a little massage place right next door of our hotel, and enjoyed a massage each day. Perfect rest before to speed up again. I had to say good-bye to my dear short pant, as the hole in it were getting bigger and bigger and I couldn’t find any place in Sanur where to repair it. 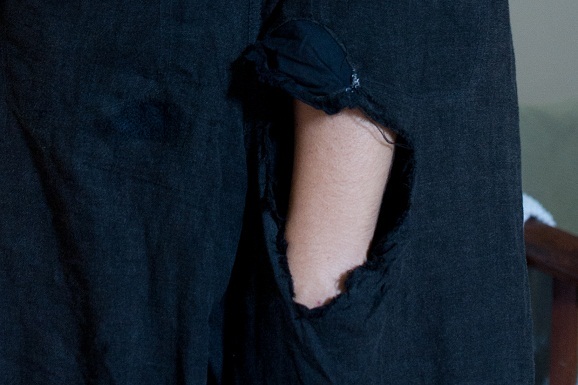 As Jenny had given me her pant, the one I had borrowed while repairing my two only pants, I could do that. Still, I had made a point of travelling with these two specific pants as long as I could and it was sad to have to leave it there but the hole was too big, ahah! Next destination…Western Australia, for a 6,000 kilometres road trip from Perth to Darwin!